Well, hello, school. This morning I’ve got a sixth-grader, third-grader, and toddler who is super excited and has no idea what to expect from Mothers’ Day Out that begins tomorrow. She missed the preschool age cut off by about six weeks, but I know she’s ready for some kind of school setting. Meanwhile, the big kids probably could have kept living their best summer lives but surely will be glad to see their friends and settle well back into the school routine. 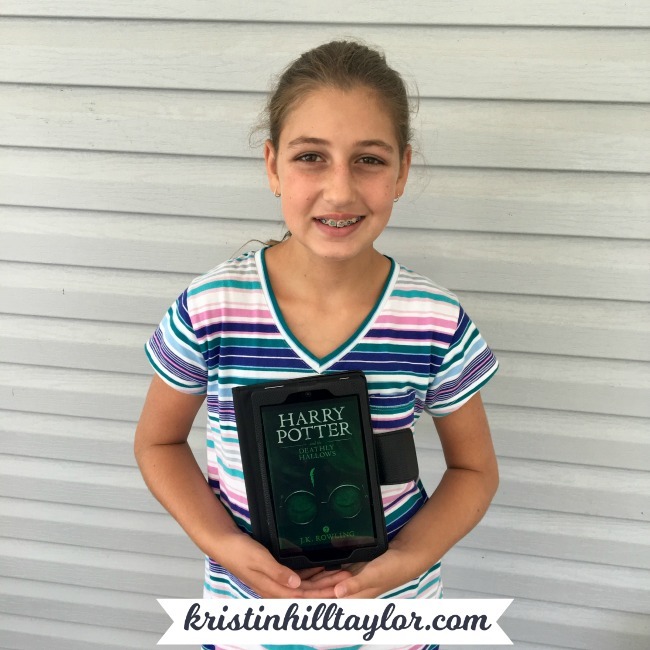 In honor of this first day back at school, my sixth-grade Cate is here sharing a review of the Harry Potter series. We bought two of the books at a used book sale on Fourth of July. She started a few days later and finished the whole seven-book series in about a month. Y’all, that’s a lot of reading in a month! 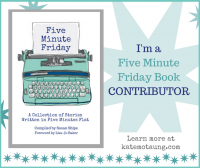 The whole series is available on Kindle Unlimited, so that’s how she read the five books we don’t yet own. 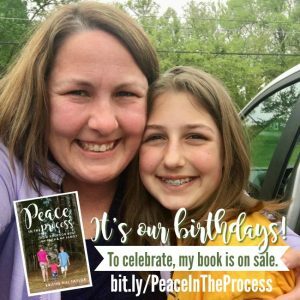 (Get the whole series in paperback or the Kindle versions here!) But my aunt is graciously mailing her the books she doesn’t have because, yes, she’s already started re-reading it! To me, the Harry Potter series is exciting and suspenseful. The details create great images but also leave enough to your imagination. Author J.K. Rowling was very creative when making this series. My favorite is the fourth one, “Harry Potter and the Goblet of Fire.” I like this one especially because of the Triwizard Tournament. I won’t spoil it in case you decide to read it, but it’s full of danger and adventure. It is also very mysterious, for several different reasons. I don’t really like danger and mystery separate, but together they’re awesome! After #4, the seventh book is probably my favorite. “Harry Potter and the Deathly Hallows” is definitely the most dangerous and adventurous. It’s very constant danger/adventure so, I stayed up late not wanting to put it down! I really love how J.K. Rowling ended it. If you want me to explain a little about the Deathly Hallows, then I’ll say a little: Harry needed a certain cloak, wand, and stone, and his enemy did not need to get his hands on them! My least favorite is the fifth one, “Harry Potter and the Order of the Phoenix.” It is the slowest story and I didn’t like the ministry, a professor, and the story. The book is very sad. Overall, I enjoyed this series – so much so I already started rereading the books! 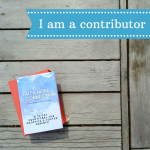 If you read them, I hope that you enjoy them, too! 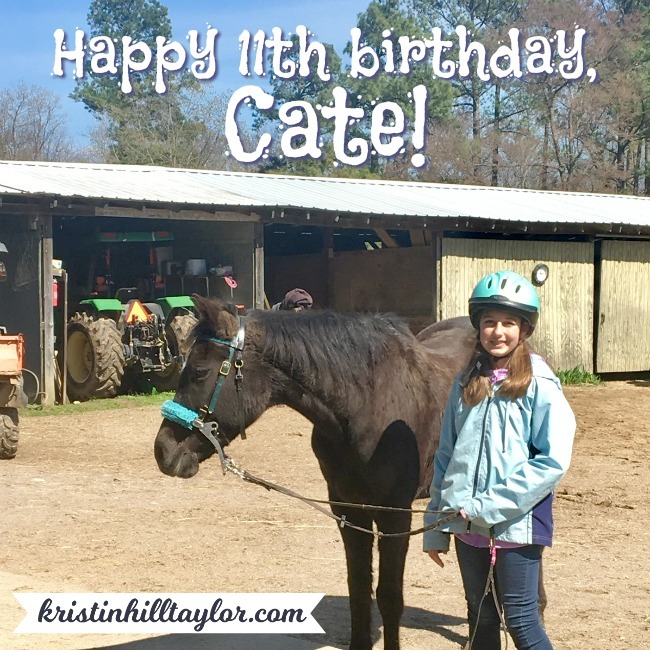 Cate, 11, will re-read books more than anyone I know, comprehends and remembers more details than I knew was possible, and loves horses. She’s excited to have a locker this year at school although she will miss sleeping in most mornings. Her momma is going to miss her help and conversation during school hours. 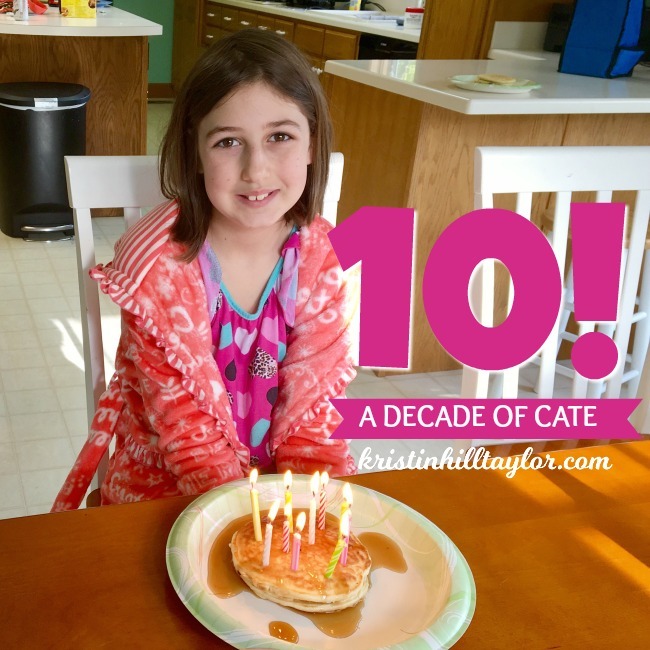 You made me a mom ELEVEN YEARS ago today, my sweet Catherine Anna. I know I sometimes forget what I walked into the room to do, but I remember welcoming you into the world like it was yesterday. Your daddy and I had waited to become parents and God took us on a surprise adventure to you. I wouldn’t trade the hard days of infertility, the emotional wait to become a mom, or all the unknowns of the adoption process for anything because that journey gave us you. You remind me so much of me – which is the best and hardest thing about being your mom. Us first-born girls have so many ideas, want to do all the things, and are confident we always know the best way to accomplish whatever is before us. I understand you in a way that brings me peace and frightens me. Just the other day, I was listening to that Andrew Peterson song “Be Kind to Yourself.” It always reminds me of you because it’s the same message I preach to myself regularly. (I wrote about that in my book.) I pray you hold on to the truth you know, worry less, always be willing to try new things, give yourself grace, and be the kind of friend you want to have. I love the way you look out for Ben and Rachel, look forward to watching “The Voice” and “Survivor” with you, and enjoy playing games with you. You’ve been a champ with the braces on your teeth this year. You read faster than anyone I know and will re-read a book you just finished yesterday. You love horses, crafts of any kind, and writing stories. You’re smart and kind. You pay attention to everything and always have a plan. I know I say it often when we pray before bed, but I’m so grateful God made me your mom and the five of us a family. I met you in that Indiana hospital room eleven years ago today, and I’m thankful that was only the beginning of your story that is so much my story too. 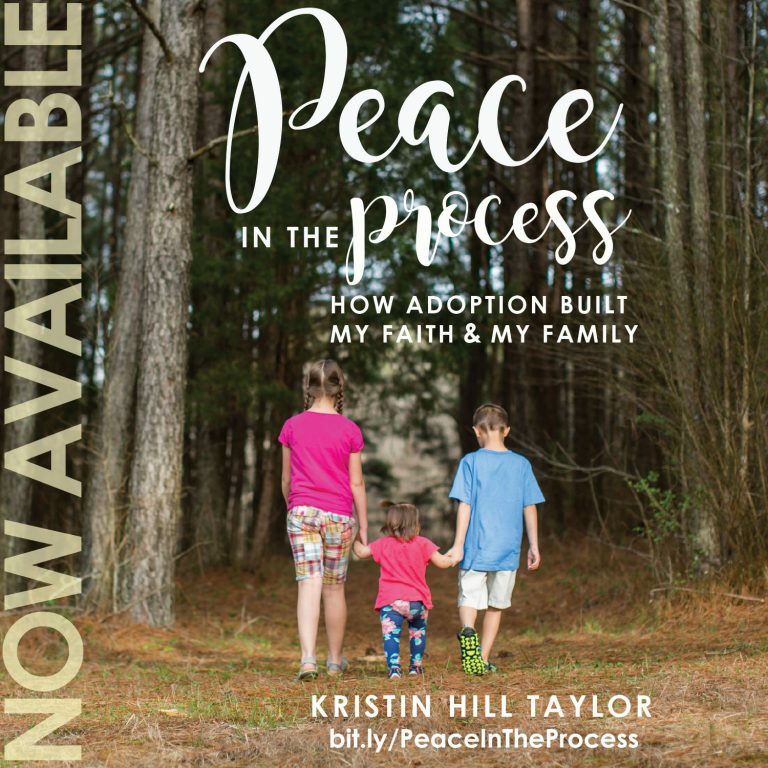 You can read more about Cate’s story and our family’s story in my book, “Peace in the Process: How Adoption Built My Faith & My Family,” which is on sale through tomorrow, May 7. And look back on Cate’s life through other birthday posts: One. Two. Three. Four. Five. Six. Seven. Eight. Baptism. Nine. Ten.